One of our proudest campaign successes, the Local Sustainable Transport Fund has handed out £600 million to local green transport projects. Cycling receives a big boost! Around a third of the Local Sustainable Transport Fund is being spent on improving cycling. 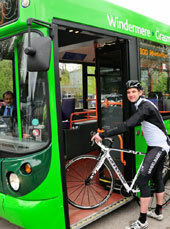 Projects include the Lake District Bike and Ride bus service [pictured right]. These buses carry up to 12 bikes and riders - perfect for exploring the Lake District on two wheels. Before 2011: We campaigned consistently for a carbon-reduction fund for transport. In 2009 we published A Carbon Reduction Fund: A Proposal for the Department for Transport's Carbon Reduction Strategy in partnership with Sustrans and Friends of the Earth. Also in 2009, the then Shadow Secretary of State for Transport Theresa Villiers committed to a Transport Carbon Reduction Fund in a speech for Campaign for Better Transport. 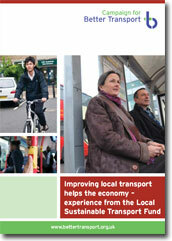 2011: The Government annouced the creation of a £560 million Local Sustainable Transport Fund. After the fund was created: Our Chief Executive Stephen Joseph was invited to advise the Government on where the money should be spent. 2012: We brought together people working on different LSTF projects around the country at an event where they could learn from and advise each other. 2014: Dozens more green transport schemes got the go-ahead, from Devon to Durham (see them on a map). We called for the LSTF to be extended and expanded. July 2014: We launched a report (pictured right) showing how Local Sustainable Transport Fund schemes are helping people into employment and boosting local economies as well as protecting the environment. August 2015: This blog reports on some recent successes of the LSTF. 2016: The Government launched the Sustainable Travel Access Fund, which is the successor of the LSTF. It aims to "boost local economies by... offering cheap, clean and healthy travel options to access jobs and education opportunities". Ongoing: We know that bus cuts, rising rail fares and polluting new roads threaten to undermine the great projects funded by the LSTF. We'll carry on fighting for fair, affordable, green transport for the whole country. Will you help us? "I am writing to you today to share a recent publication by the Campaign for Better Transport... Its findings confirm that sustainable transport projects play a vital role in growing our local economies... I hope you will consider including sustainable transport in your future local growth plans"